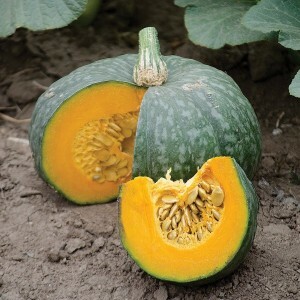 Pumpkin (Jade Prince) is a hybrid variety that shows vigorous growth, good resistance to viruses and diseases and is prolific. The fruit weighs 1.5-3.0 kg and has a long shelf life. Flesh is orange-yellow in color, firm and has an excellent sweet taste. Maturity is around 60-75 days from sowing, suitable for both immature green fruit and fully matured fruit. Easy to set, each plant can set about 2-5 fruits.